The Society Committee is democratically elected by the Society membership, with half of Committee positions coming up for election at each AGM. The most recent elections of Society Committee members took place at the 2018 AGM in June 2018. The next planned opportunity to stand / vote for Society Committee members is on June 2019. The Society Committee members are listed below are generally elected for 2 year periods. The Society Committee typically meets once a month to discuss issues affecting the Society and the club. It also elects its own officers, including chair, treasurer, etc. Meet the current Society Committee members below. Michael is an ex Referee who has found "Real Football" again through supporting City after becoming disillusioned with the money and cheating of the Premier League teams and players. Michael and his son (and occasionally his daughter) are generally to be found behind the goal City are attacking with large black and white chequered / striped flags. Come and say "hello" next time.. Michael was elected chairman in 2017. Emma's a very new Bath City Supporter. 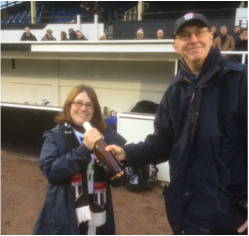 She was captured by the community feel of the club through her involvement with the Bid and was keen to see how else she could volunteer to support the club. She brings with her a 'can do' attitude and prior experience of serving on a committee having been active in a number of roles on Bath Rugby Supporters' Club. Her first Bath City match was at home against Hemel Hempstead where we won 6-0 in the 16/17 season. Steve has been a lifelong supporter of the club and experienced both the highs and lows in that time. He was actively involved with Bath City Youth for several seasons whilst his son played and this included qualifying as a referee. Steve has been part of the excellent work of the Community Foundation for the past 3 years and he looks forward to the time when the club can take an even greater community role both locally and city wide. Cheryl is a longstanding volunteer with the Supporters Club and currently serves as treasurer of the Big Bath City Bid, the Society's fundraising campaign for community ownership. 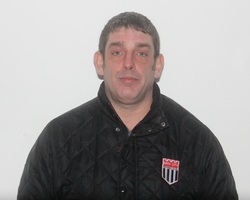 Shane is a long-standing supporter and has represented the Society on the club board for a number of years, as well as serving as the club's Safety Officer. Shane will continue to serve on the club board once the Society formally takes a majority stake in the club. Pete first started following City in 1968 and after almost 50 years he is still here! Now an exile, his family still lives in Bath and Pete gets back regularly to support the team. 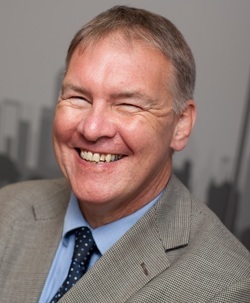 Pete is also Chief Executive of a housing Association in Derby. Marc is a teacher and qualified football coach. 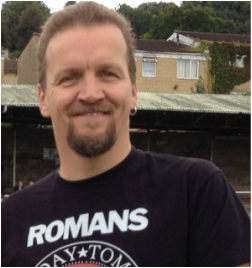 He has been part of the Big Bath City Bid team and is especially interested how Bath City can develop community engagement. ​Mr. Stuart Page is an experienced international businessman, senior executive and security expert in international affairs and engagement from the Australian diplomatic service, security, intelligence, military and the United Nations and a sports enthusiast. 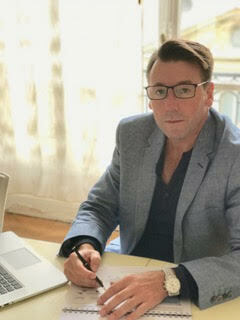 Mr Page is the CEO and Founder of Enigma Alliance (www.enigma-alliance.com) and an advisor to several other international companies. He was previously with the International Centre for Sport Security (ICSS) and has previously held senior positions for over 20 years in the diplomatic service (The Department of Foreign Affairs & Trade [Australia]) both domestically and overseas, for the Department of Defence, an Australian intelligence agency, Australian military and the Department of the Prime Minister & Cabinet, where he advised former Australian Prime Minister John Howard on the APEC meetings. Mr Page’s last senior diplomatic post was Assistant Secretary Diplomatic Security Branch, where he was responsible for the security & safety of the Australian diplomatic corp. This involved responsibility for the protection and safety of 7,000 personnel, AUD 3 billion in assets (embassies, buildings, equipment, vehicles), and classified information in over 100 countries. Mr Page also has served as Australia's representative on an oversight committee of technical security countermeasures (TSCM) & cyber security for five countries. Mr Page alongside serving as the CEO and Founder of Enigma Alliance (www.enigma-alliance.com) works closely with his charity support to Street Kids in Africa, Global Sports Integrity education fund with 6 universities in Europe (www.maisi-project.eu/the-international-advisory-board) and 65 Degrees North (disabled war veterans rehabilitation through sport). He is also a board member and served a rotation in the Vice President position on the Board of Trustees to UNICRI, since 2009 for United Nations initiatives through UNICRI.